Praveen’s latest “The Arsenal Annals” column. Summer of 2016 was seen as one of the most significant summers in Arsenal’s history as that could serve as their longest-serving manager Arsene Wenger’s last summer at the club. The manager brought down Mohamed Elneny last winter in light of the club’s dire need of central midfield additions then. However, he was swift to bring down an upgrade in the form of Granit Xhaka, who has already cemented his place in the starting line-up by dint of his awareness, unpredictability, and aesthetically pleasing long balls. Upon being questioned at the back of Xhaka’s arrival about potential arrivals, the Arsenal manager announced that he would sign two more outfield players between then and the end of the transfer window. In light of long-term injuries to Danny Welbeck, Per Mertesacker and Gabriel Paulista, however, he found himself in a position where he should bin his Plan A in favour of a need-of-the-hour Plan B; he himself voiced his frustration, stating he had to ‘restart’ since the transfers did not come off the way he had wanted. However, his restarting phase meant that Arsenal confirmed the arrival of no first-team player over the age of 20 for more than three months. The three months’ inactivity, in turn, birthed unrest amongst the Emirates Stadium faithful as the fans took to the social media to lambast him; they can be forgiven, though, especially since Arsenal’s title rivals were announcing Ilkay Gundogan and Paul Pogba, among others. However, the Frenchman stayed level-headed and chose not to foolishly rush decisions. He has now made two signings, who can improve the side significantly. Shkodran Mustafi has been signed from Valencia for £35 million. 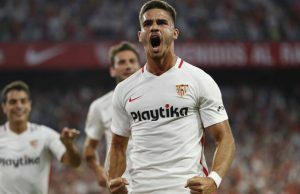 Despite the fact that he was only signed because of the injury crisis, his playing style is as Arsenal-esque as it gets; his tackles, composure, passing prowess, aerial ability, and positional awareness makes him an ideal partner for Laurent Koscielny and a potential long-term fixture in the starting line-up. Lucas Perez, who can also play down the left flank, is in the same mould as former Arsenal target Jamie Vardy. Although he does not answer the Gunners’ five-year search for a world-class striker, his presence means Arsenal could implement an effective alternative plan in the event of Olivier Giroud going through his inevitable goal drought. Mustafi and Perez…. two crucial signings for Wenger and Arsenal. In addition to signing players whose impact will definitely be instant, he has brought down a few exciting prospects in Robert Holding, Kelechi Nwakali, and Takuma Asano. However, the six arrivals meant the under-achieving players and fringe players should be loaned out in search of playing time. The three-time Premier League winning manager had previously been censured for being the causative agent for complacency in Arsenal players, but he has now adopted a carrot and stick approach as he has sanctioned loan moves for fan favourite Joel Campbell and English talents Calum Chambers and Jack Wilshere in the same transfer window. The ‘stubborn’ manager has spent almost £95 million on six players this summer; in an era when the amount of money spent is seen as a reflection of a manager’s ambition, the shrewdness of his transfer dealings sets him apart. Perhaps, he is not so out of touch as his detractors may conjecture. Next Story → David Luiz: Masterstroke or a £34 million waste of money?